FolderSync will secure your local changes to your FolderGrid domain immediately, and by default FolderSync will look for changes made by other users every 5 minutes. This 5 minute "sweep interval" is generally a good balance between conserving bandwidth and supporting synchronization with frequent remote changes. However - you can adjust the sweep interval to check for other users' changes more or less frequently based upon your specific needs. By setting the sweep interval to zero you can run continuous sweeps for near realtime updates or by adjusting the sweep interval higher you can check for changes less frequently and conserve additional bandwidth. Note: If you require realtime synchronization of your secured content for collaboration (multiple editors of the same file) then you need to work with your content through our WebApp and use "Open Locally" instead of maintaining local copies through folder synchronization. You should also enable and use file Locking for your domain. 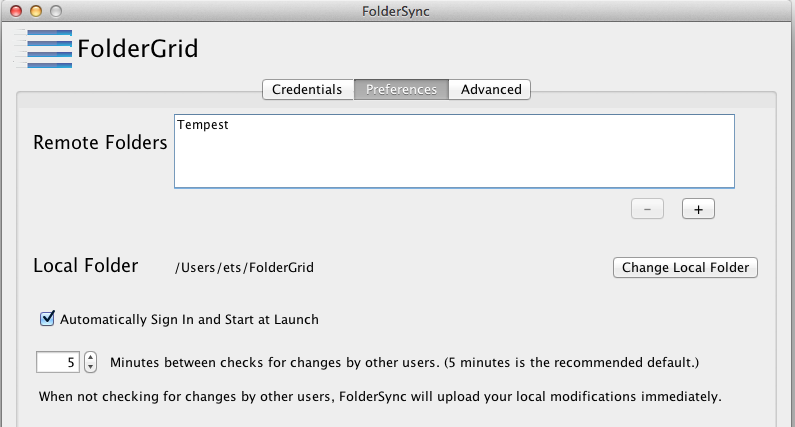 User #1 opens a local copy of "Myschedule.doc"
User #2 also opens a local copy of "Myschedule.doc"
User #1's FolderSync pulls User #2 changes down from FolderGrid and tries to overwrite User #1's local copy of "Myschedule.doc"
At this point - it is up to the application User #1 is using as to how it will handle the attempt to load User #2's changes. Some editors will refuse the changes because User #1 has the file open for editing. Others will allow the changes but not alert User #1 so when she saves her changes then User #2's changes are overwritten. Still Others will prompt User #1 and make her decide whether to accept User #2's changes or not.